I'm a little late blogging for Valentine's, St. Patrick's Day and Easter - but better late than never! It's always fun when someone asks me to make something customized just for them. Sometimes it's just a color scheme or size adjustment, and other times it's a slightly different version of the original. I enjoy the challenge! In January of this year, one of my customers asked me if I made any pet bandanas other than the slipcover and over-the-collar styles. 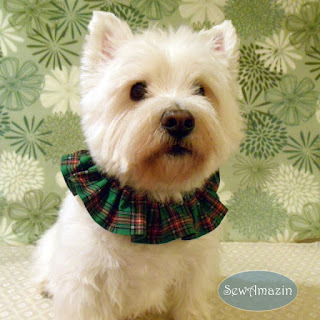 Her husband needed something easy to put on and take off for their Westie to wear on therapy visits to some local nursing homes. The result was a 'scrunchie bandana' - a kind of hybrid of the bandana collar slipcover design and my scrunchie neck ruffle. 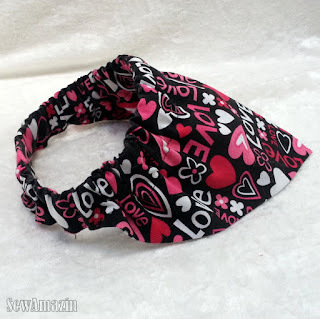 I shared the sample on my Facebook page and the feedback was positive, so I added the new style to my shop for Valentine's Day with this Love & Hearts Scrunchie Bandana. The elastic neckband of the scrunchie bandana is custom sized so that it stretches to about 1.5 times the pet's neck size, so it slips easily over the head. 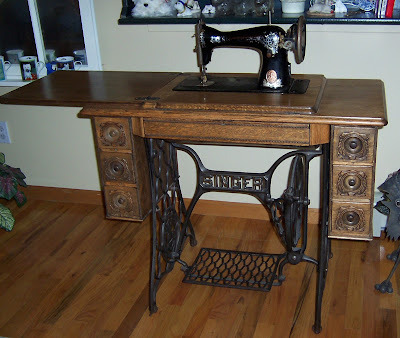 The seams are all neatly finished with no raw edges showing. 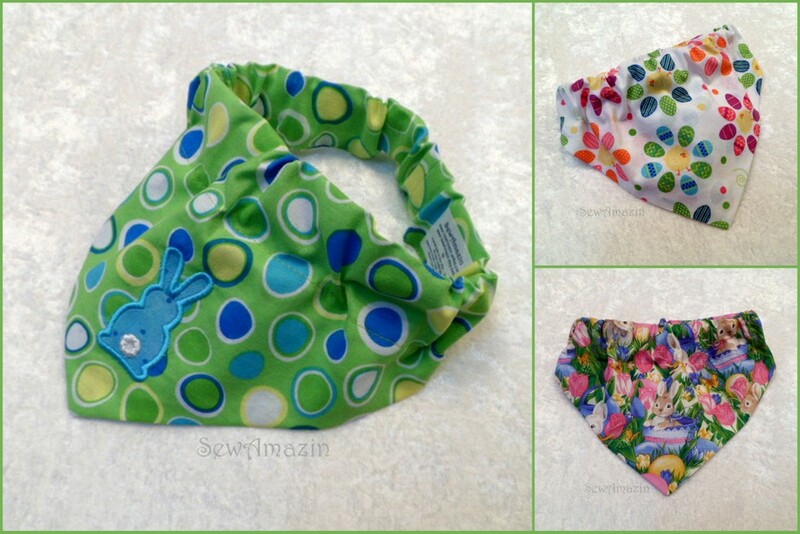 The triangle section of the bandana is the same basic size as the collar slipcover style bandanas; I've updated several of my shop listings for collar slipcover style bandanas so that they can be ordered as scrunchie bandanas, too. Here's a 2013 scrunchie bandana version of one of the 2012 slipcover style bandanas - a dark green Shamrock is appliqued onto Shamrock toile fabric on this St. Patrick's Simple Shamrock Bandana. Also new this year, I added a matching Happy St. Patrick's Day scrunchie bandana and neck ruffle with Irish phrases on them. 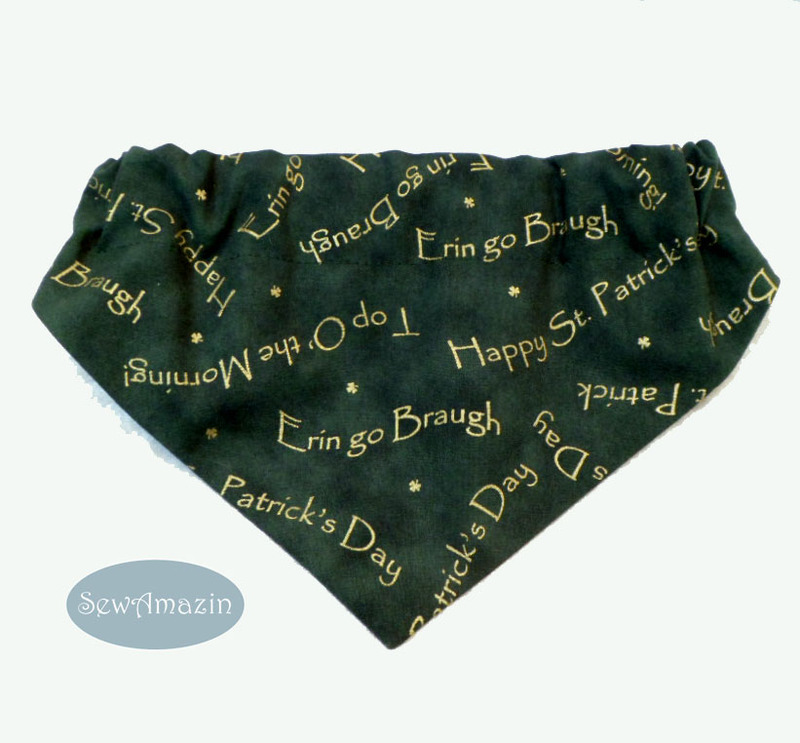 Below, you can see the Irish phrases printed in metallic gold on dark green on the The Erin go Braugh bandana; Penny models the Top O' the Morning ruffle. I found this green tartan plaid print on a recent excursion to a local quilt shop and couldn't resist using it for another matched ruffle and bandana. Keli is modeling the Mad for Plaid Scrunchie Neck Ruffle, below; you can see the pattern close-up in the Mad for Plaid Scrunchie Bandana. For Easter I added four new scrunchie neck ruffles. The Jelly Beans and Vintage Style Bunnies on Lilac (top row) are brand new fabrics; The Easter Bunnies on Lavender Gingham and Abstract Easter Eggs (bottom row) match bandanas and collar slipcovers from previous years. 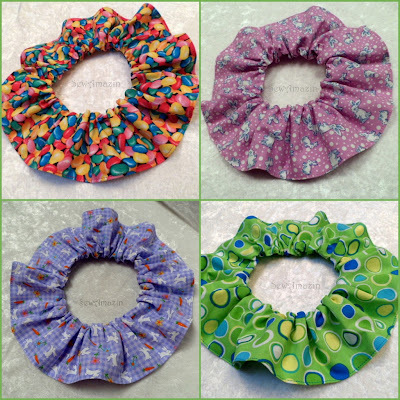 I added 3 new scrunchie bandanas to my shop for Easter. The large photo below shows the Blue Bunny Applique on Abstract Easter Eggs bandana. We thought it would be a more masculine bandana for the boys. That's a machine embroidered applique design of the backside of a bunny showing off his cotton tail. I edited the Three Bunnies Applique design from Embroidery Boutique to use just one of the bunnies. 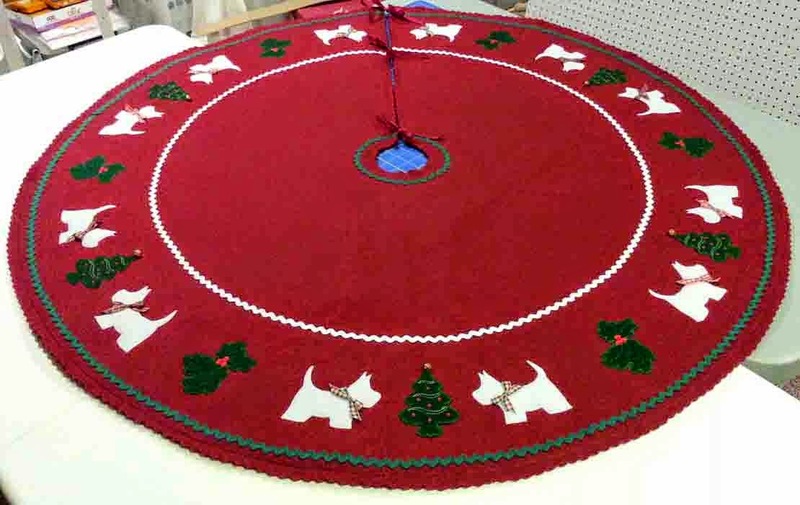 The embroidery is completed before the bandana is sewn together, so the stitching is concealed by the back of the bandana. 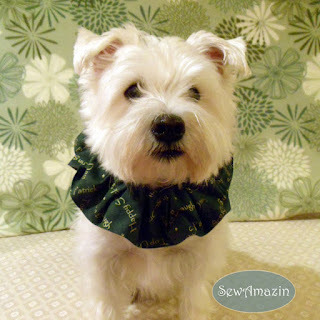 The Easter bandanas and ruffles were featured in my Spring Ahead - March 2013 Newsletter.